To make it into the Top Fishing Lures category, they must be durable and effective. I’ve caught lots of fish on these lures. I go back to them time and time again because they have worked for me in the past and because I have confidence in them. And those are the keys. There are lots of choices here, and lots of different kinds of lures work. You don’t need them all to catch fish. The idea is to pick a few and get out on the water. You’ll learn what works better for you, and begin to develop confidence in them. They'll become your Top Fishing Lures, and you'll be a better fisherman! When fishing shallow flats along the Texas Coast where sight casting to redfish is a possibility, the top fishing lures come from a new line of tied jigs called Buggs. These lures have proven deadly. They land softly, and ride hook point up to reduce snags. They're called Flats Buggs, and come in two main styles. When making short casts in calm conditions where stealth is of the utmost importance, I prefer the Flats Buggs with double bunny tails. When dealing with more wind, and making longer casts I prefer the curl tail variety. 1/8 and 1/4 oz. Flats Bugg with Double Bunny Tails - Gotcha, Pink, Rust, White, Black. More information on these lures can be found at the website - Buggs Fishing. Early in the day I’ll start with dark colored soft plastics or topwaters. The top fishing lures for the surf imitate baitfish and have a larger profile. I'll be adding shrimp imitations as I use them more and develop more confidence in them. Texas Trout Killers by Texas Tackle Factory. Colors: Morning Glory (Black with a Chartreuse Tail) or Red Shad (Black over Dark Red) or Pumpkinseed with a Chartreuse Tail. Devil Eye by Brown Lures. Colors: Amber or Black Cat (Black with a Chartreuse Tail) or Dark Strawberry Blue (with a White Tail). I’ll use 1/8, 1/4, and 3/8 oz. jig heads, screw locs with black nickel hooks. Skitterwalks by Rapala. Colors: Silver Mullet or Speckled Trout or Bone or Hot Chartreuse. As the sun gets up later in the day I’ll go to a lighter color soft plastics and silver spoons, especially if the water is clear. I’ll keep using the same topwaters I used early. Texas Trout Killers by Texas Tackle Factory. Colors: Pumpkinseed with a Chartreuse Tail or Laguna Pearl (Green Glitter over Pearl) or Texas Chicken (Pink over Chartreuse Sparkle with Red Tail). Devil Eye by Brown Lures. Colors: Glow or Chartreuse or Pink Hologram. Johnson Sprite Spoon. Colors and Sizes: Silver 1/4 or 1/2 oz. When you get in the surf first thing in the morning, always work the water close to the beach first. Don’t stomp through the first gut to the second bar without fishing the gut first. There are lots of fish in the first gut – especially early! In the Spring, Summer, and Fall, I almost always start with soft plastics. I’ll fish topwaters early at times, and then use spoons in grassy areas where I think there may be redfish. The top fishing lures in the bay are baitfish imitations. I'll be adding shrimp imitations as I use them more and develop more confidence in them. Norton Sand Eel Jr. by Norton Lures. Colors: Black Magic (Black with a Chartreuse Tail) or Pumpkinseed with Chartreuse Tail or Plum with Chartreuse Tail or Tequila Gold with a Chartreuse Tail. Texas Red Killers by Texas Tackle Factory. Colors: Pumpkinseed over White with a Chartreuse Tail or Purple with Chartreuse Tail. Killer Flats Minnow by Texas Tackle Factory. Colors: Pumpkinseed with Chartreuse Tail or East Beast (Dark Green over Light Green Flake with Chartreuse Tail). I’ll start with 1/8 oz. jig heads, and use 1/16 oz. when I need to work them slowly or in very shallow water, and 1/4 oz. when I’m fishing deeper water. I'll use weedless jig heads in 1/8 and 1/16 oz. when I'm fishing in grass. Super Spook Jr. by Heddon. Colors: Bone or Speckled Trout or Silver Mullet. Johnson Silver Minnow. Colors and Sizes: Gold 1/4 or 1/2 oz. In the Winter and during the colder periods of Spring and Fall, I’ll start with Corkies and then switch to soft plastics (same ones listed above). The top fishing lures during the colder months are larger baitfish imitations. Corky Fat Boy – B & L Manufacturing. Colors: Amber or Chartreuse or Black early in the day or when water is off-color. Dayglow or Pink Hologram or Chartreuse in the middle of the day or in clear water. Corky Devil – B & L Manufacturing. Colors: Amber or Chartreuse or Black early in the day or when water is off-color. Dayglow or Pink Hologram or Chartreuse in the middle of the day or in clear water. They are made to be worked slowly. Let is sink for 5 or more seconds and then give it a couple of good twitches and then a little slack. You’ll move water, make it dart, rattle, and then it will glide. Hang on while it’s gliding! The fish might rip the rod right out of your hand! 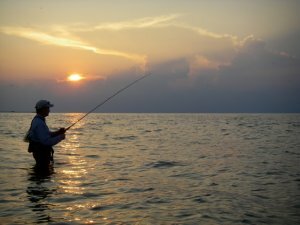 So there they are - the Top Fishing Lures for the Texas Gulf Coast. Pick a few for the situations and conditions you'll be fishing in and get out on the water! You'll learn what works for you and develop confidence in them. Return from Top Fishing Lures to the Fishing Lures page.